We loved it, great facilities and very good value for money and access to public transport and too cool indeed that it has a small kitchen area even in this small room and has such a 'green' ethic (wind powered) and is so 'practically' green too eg the provision of the soap etc dispensers! Very helpful staff as well! Good experience. Issue was size of "living area" - too small and stairway too steep and narrow. We loved the location. So handy to the tram, plenty of great restaurants and all the conveniences. Room was spotless, comfortable and enjoyed coming back from a day out to a freshly made bed!! Loved it. Very unique hotel. Well designed. Wanted to stay longer. Good location. Nice and clean room with comfy bed! Shower area is a bit too small though. Overal good experience. Keep it up. Overall happy with the hotel and room, however the noise when someone else shuts their bedroom door was disappointing. My entire bedroom door shook when someone else closed theirs. In all honesty, that would deter me from staying again. A shame because everything else was good. Booked the hotel online after never having been in Melbourne. Could not have been more impressed with the location or how helpful the staff were at check in. The rooms were more spacious then I envisaged and with the exception of a very few minor things, were very clean and well kept. The hotel has done a great job with the little amount of room it has, particularly the restaurant area. Breakfast was always wonderful with a great range both at the buffet and off the menu. 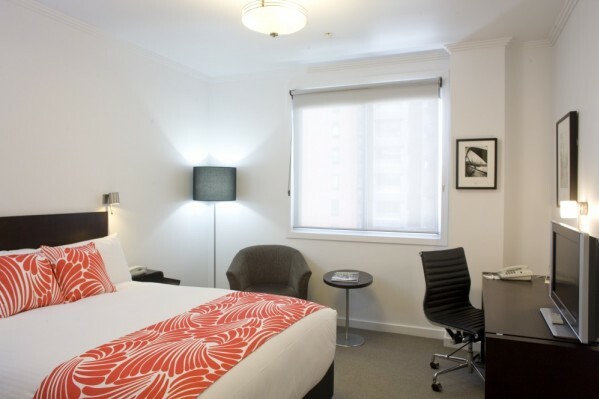 Would definitely stay at the Alto on Bourke if going to Melbourne and would recommend it to anyone doing the same. Our first visit to Melbourne for many years. The staff were knowledgeable and helpful. The brochure collection in reception was excellent and relevant. The housekeeping staff were unobtrusive and very efficient. We very much look forward to our next visit to Melbourne and to staying at the Alto. Very helpful staff, very professional, nice room, great breakfast, great library, fabulous location. Loved the green energy and focus on reducing resource use. Many thanks to the staff who got our footy tickets printed out at the last minute! Very good, have stayed previously and will stay again. Nice, clean hotel. Rooms nicely decorated, on the smaller side but include a kitchenette. Breakfast was great and worth the extra fee. 3rd stay at Alto, and continue to enjoy averything about the hotel, and would definately stay again if it fits in with travel plans. Couldn't fault anything. Have stayed there before and will stay there on any future trips to Melbourne. Ticks all the boxes for us. Staff are always friendly, helpful and welcoming. Staff and service are just brilliant, nothing is a problem and things just happen. The only thing preventing a "perfect" rating is that we have not been able to get the Australian Financial Review delivered in the morning despite being told on both occasions we stayed that this could be done. Very pleasant hotel to stay at - location was perfect - train at end of road, tram outside therefore excellent for visitors without a car. Like the recycling aspect as I feel that is important. Friendly staff and easy to book, find and stay at the Alto. Location was excellent with the trams and trains to everywhere so close. Excellent location in Melbourne CBD, close to Southern Cross station and trams. Small but comfortable bedrooms and excellent staff. The only unsatisfactory feature is the lack of valet parking, and the absence of onsite parking. Sorry we do not have a valet parking service. We do have a small number of onsite parking spaces. However as this area is accessed via a single width lane there may be slight delays in accessing or exiting the parking area. Very comfortable stay, staff were very accommodating. Loved the stay. Staff very friendly and great location for the footy at ethiad and close to train/bus to airport. I was impressed by the cleanliness. My wife, daughter and I were in Melbourne for a few days to celebrate a birthday and, I must say, we couldn't have picked a better place to stay. Great location, very nice apartment, helpful staff. Was all good. Very happy with the location. Closet to all major attractions. Staff were very helpful. I thought the decor was delightful - the ambience was great. Very happy with most aspects. Couldn't get breakfast though because not enough room in restaurant. Our restaurant can become busy at times depending especially if many guests decide to dine at the same time. While we cannot always predict when this will ocurr we will provide a table as soon as possible, usually within a few minutes. Alternatley we can call you in your room when a table is available. If you need to leave quickly there is a Grab & Go menu where we will prepare a hot item in a takeaway bag plus takeaway coffee / tea, fruit, muffin or croissant. Fantastic, we love coming to Alto and will be back at some stage. The breakfasts are outstanding! !